Scott's Blog of Stuff: Week 23 - Feeed meee! 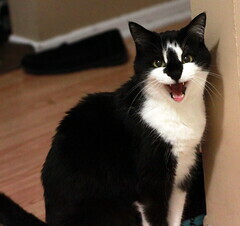 So, here's our cat, Sam, once again gracing my blog. I bought a 50mm f1.8 lens off a seller on Ebay earlier in the week and it arrived on Friday. While testing it out, Sam decided she wanted to be fed and was quite vocal about it. I couldn't pass on the opportunity to snap a shot or two.